One of the most popular safety items from Barrier Group Pty Ltd is the Port-A-Guard expanding barrier designed for diverse public environments. Port-A-Guard expanding barriers are now available at up to 30% less in price. Available in a variety of sizes starting from 3.2 metres to 5.0 metres in length, these portable barriers are ideal for use in airports, shopping centres, schools, sports stadiums, outdoor events and warehouses. Port-A-Guard expanding barrier is a portable, expanding crowd control barrier. Compact and lightweight in design, the barrier is suitable for indoor or outdoor use. The design of the extruded aluminium slats and vertical posts is both strong and lightweight while the injection moulded plastic feet ensure that the complete unit is durable and corrosion-free. When fully extended, Port-A-Guard expanding barrier is 3.2m or 5.0m in width. The Port-A-Guard is a versatile and portable solution to all pedestrian and vehicular traffic control problems. Like all Port-A-Guard models, the BPG1 can be customised with additional slats or castors. 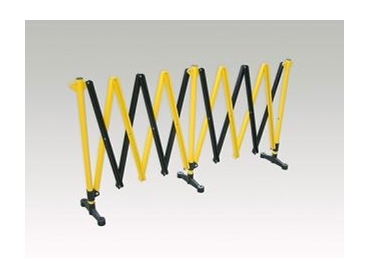 Available in standard 3.2m to 5.00m widths, they are finished in red/white or black/yellow powder-coat. Port-A-Guard expanding barrier comes in a variety of options including freestanding, wall mount (ideal for factory doorway temporary closures), surface mount, flexi (able to pivot in the middle and expand to 5.4 metres), utility U-shape and escalator model with secure suction cups for fixing on each side of elevators or escalators during servicing. Optional fittings include sign holders, hanging sign bracket, castors, base weights and locking wall receiver.